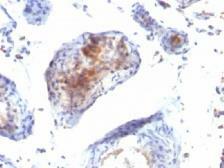 Specificity/Sensitivity: Recognizes a protein of 47-55kDa, which is identified as FOXP3. 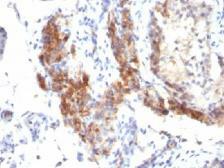 Its precise epitope is not known, but it has been mapped to the N-terminal portion of the protein. The FOX family of transcription factors is a large group of proteins that share a common DNA binding domain termed a winged-helix or forkhead domain. 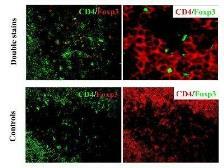 During early development, FOXP1 and FOXP2 are expressed abundantly in the lung, with lower levels of expression in neural, intestinal and cardiovascular tissues, where they act as transcription repressors. 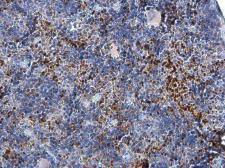 FOXP1 is widely expressed in adult tissues, while neoplastic cells often exhibit a dramatic change in expression level or localization of FOXP1. 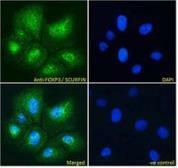 Mutations in FOXP3 gene cause IPEX, a fatal, X-linked inherited disorder characterized by immune dysregulation. 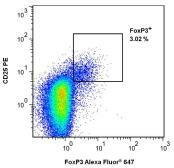 The FOXP3 protein is essential for normal immune homeostasis. Specifically, FOXP3 represses transcription through a DNA binding forkhead domain, thereby regulating T cell activation. 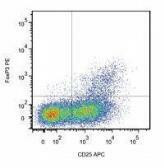 Specificity/Sensitivity: The mouse monoclonal antibody 3G3 recognizes N-terminal region of FoxP3, a 47-55 kDa transcription factor, which is the master regulator in the development and function of regulatory T cells.